UNITY TICKET. It’s an unbeatable team up of Mayor Baba Yap and Vice Mayor Toto Veloso (LP) with their dream team of 7 re-electionist-kagawads and 3 newcomers. 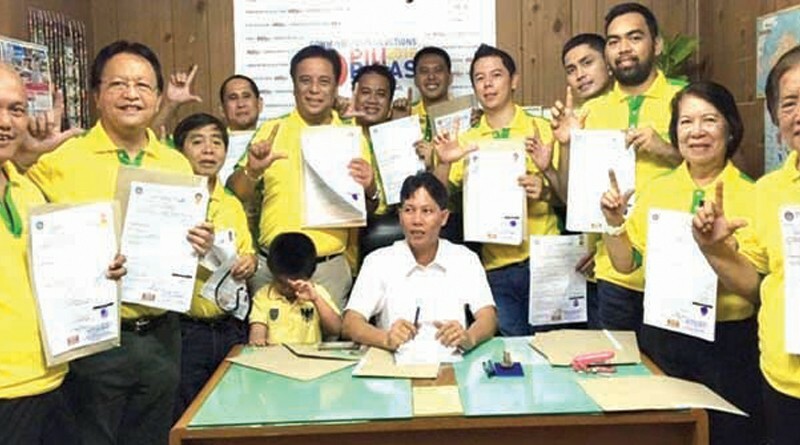 The ruling Liberal Party in the city shows early dominance for the 2016 polls after the group of former City Mayor Dan Lim failed to come up with a complete slate until the filing of the certificates of candidacies (COC) came to a close last Friday. Meanwhile, former City Kagawad Edgar Kapirig filed his COC for city mayor as an independent bet while Dr. Alfred Hontanosas also filed as an independent bet for vice mayor. The unity ticket of re-electionist Mayor John Gessnell “Baba” Yap II and Vice Mayor Jose Antonio Veloso fielded seven re-electionist city councilors with three new comers. The Yap-Veloso political wedlock is completed by the council slate of re-electionist Kagawads Adam Jala, Jojo Bompat, Pepot Besas, Dodong Gonzaga, Dulce Glovasa, Jerry Pabe and Betty Torralba while the new comers are Engr. Ondoy Borja, businessman Greggy Gatal and businessman Jonas Cacho. The group of Lim, meantime, fielded Poblacion I Barangay Captain Arlene Karaan for city mayor with no running mate for vice mayor amid speculations that she will be substituted before Dec. 20. The group of Lim filing under the Partidong Masang Pilipinas (PMP) has five bets for city kagawads, namely re-electionist Kag,LucilleÂ Lagunay,Â Manga Barangay Captain Leda Saco, Booy Barangay Cap[tain Eutorgio Telmo, Jr., Paterna Ruiz and Mary Liene Shaene Karaan. Such Â progress is seen by Â Gov. 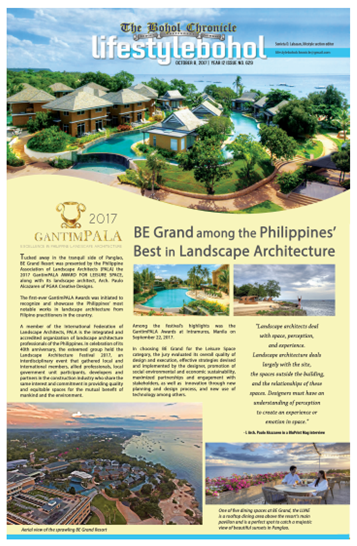 Edgar Chatto and Rep. Rene Relampagos not just for Boholâ€™s lone city but whole province especially if Â the administration slate led by presidential bet Mar Roxas and running mate Leni Robredo Â will sweep the 2016 polls. It was the first time that the entire ticket of the newly-minted unity in the city was seen -very much unlike the others. Yap and Veloso thanked for the efforts which worked out for the unity ticket which at the early stage appeared to be a toll order for Gov. Chatto and Rep. Relampagos to seal. AÂ harmonious Â obsession for progress is expected to result in Â greater confidence, according to the tandem which is one of the most politically Â potent Â in Â Tagbilaran politics, according to some observers. Chatto, LP provincial chair, vowed to Â insure more “city progress” in tandem with the Sangguniang Panlalawigan chaired by vice governor Conching Lim. Yap himself cited the â€œBoholanoâ€ in presidential bet Roxas who wasâ€”and has been— by the Boholanosâ€™ side during the Â epic earthquake episode Â that Â hit the Â province exactly two years ago lastThursday, October 15. Veloso rallied the Tagbilaranons to appreciate the development programs under the Aquino leadership which has enhanced the growth of this capital city of booming province. The best way to express this appreciation is to support the Roxas-Robredo tandem in the coming election. During the presscon, the Yap-Veloso team presented certai advocacies Â involving governance reform, revenue generation which even this time is regionâ€™s ablest, tourism, education, social welfare, peace and order and others. Veloso committed to a legislature that maintains Â a check and balance as he commends Yapâ€™s declared respect for the wisdom and independence of the Sangguniang Panlungsod or city council. Kagawad Gonzaga, who had himself fought Yap for mayor in the 2013 election, described the Yap-Veloso oneness as a â€œsign of political maturityâ€. Gonzaga said the unity and cooperation is an â€œenduring giftâ€ on the mayorâ€™s birthday to the people of Tagbilaran. The city and provincial slates are minting by their team tags alone—â€œTeam BaToâ€ and â€œTeam ChaCoâ€—which respectively stand for Baba and Toto and Chatto and Concepcion, the latter which is the first name of the reelectionist vice governor.